The Health and Human Services mandate that contraceptives be covered by health insurance plan with no copay or deductible is anti-Populist, violating the Natural Law-Natural Rights principles of the Declaration of Independence. It also is particularly anti-Catholic since the Catholic Church has a deep and beautiful understanding of the beauty of the sexual act that is violated by contraception and the Church also stands as the preeminent defender of the Natural Law principles upon which this nation was founded. The free practice of religion has never meant in the United States that you need to shut up your faith within the boundaries of the Church. When you walk out of the Church, the ability to freely practice your religion is still protected by the First Amendment. What does the free exercise of religion consist of? Religion (of any kind) is a profound conviction about the truths of reality that calls its followers to a pursuit of the Natural Law and the moral life and acts of charity and evangelization. People craft their entire lives around their deepest convictions. In Populism, freedom of religion has a particularly preeminent pride of place. Unlike in Christendom, where the state was considered competent to make theological judgments (like heresy convictions), the Populist State is demoted from making such judgments. The Populist state operates within the Natural Law as it relates to how people treat each other. But it declares its own ignorance and lack of expertise on deeper matters of Natural Law such as man’s relationship with God. This demotion necessitates a rich Church operating autonomously from the State in American political and cultural life. It would be easy to assume that President Obama has not thought through these issues. 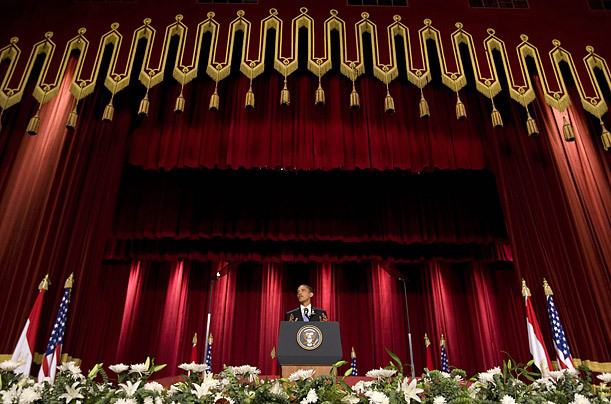 In President Obama’s speech at Cairo, he first began to replace the term freedom of religion with freedom of worship. He has been using this term ever since. Apparently, he literally believes that the free exercise of religion really should be shut up within the walls of the worship building. Evangelization, moral conviction, and the other aspects of freedom of religion are shut down by this phraseology out of the public square. Now, the New York Times Editorial Board (that flagship of the Left) has condemned the possibility that the Obama Administration may broaden the exemption to include specifically Catholic nonprofits — Catholic Hospitals, Catholic Charities, Catholic Universities, etc. The Administration is likely to make such a declaration to defend the mandate from being declared unconstitutional and removing standing from Belmont Abbey College, which has brought a precedent-setting First Amendment a lawsuit in court. This (if it even transpires) is not a move to protect Catholics from persecution for being true to the tenets of their faith. It will exclusively protect religious nonprofits, not individuals. It says that one can only take a moral stand for one’s faith if working for a faith-based nonprofit. This conviction cannot apply to everyday life in the marketplace. It is a cynical move to protect the mandate as an ongoing tool that will, whatever the Administration says, lead to the persecution of Catholics. If I am a Catholic business owner and I believe that abortifacient drugs (like Ella), contraception, and sterilization are inherently evil and I refuse to cover them, then I will be subjected to business-crippling fines. But it is not only Catholics that are threatened. Every single person who believes in the Natural Law; every single person who truly believes in the Declaration of Independence; every single person who believes that human beings should never treat each other as a means to another end such as pleasure; every person that adheres to the Christian faith as it has been taught from time immemorial until the Lambeth Conference in 1930; every single person who is devoted to the Truth is threatened. Do not be deceived. Even if the exemptions are broadened, the mandate remains anti-Natural Law, anti-Declaration of Independence, anti-religious liberty, and anti-Catholic.